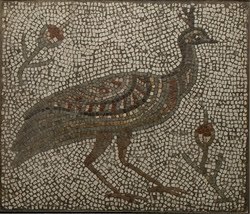 Want some culture this weekend? Get to the GALA Hispanic Theatre, which is offering buy 1 get 1 free tickets for the last weekend of Lorca's El retablillo de Don Cristóbal / The Farce of Don Cristóbal and the Maiden Rosita. It's a puppet play and sounds pretty fun -- I wrote about it a couple of weeks ago. The shows are Friday and Saturday at 8 pm, and Sunday at 3 pm. For tickets call 202-234-7174. The theatre is at the corner of 14th and Park. 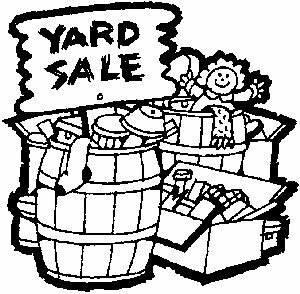 Well, it's about the time of the year where it gets nice out and people decide to have yard sales, but it looks like this weekend is rather sparse. There's one at 13th and Fairmont on Saturday, and that's it in our neighborhood. The only other nearby one I've seen advertised is at 16th and U. 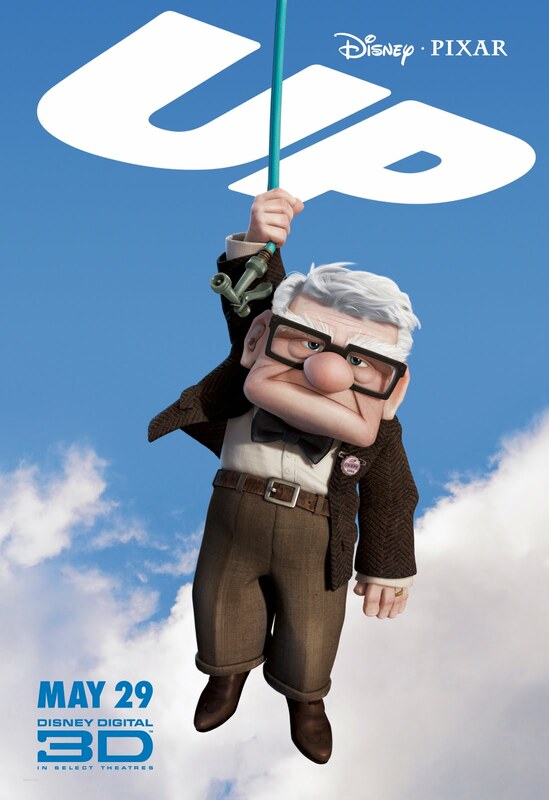 On the heels of the 14th and U announcement, Mt. 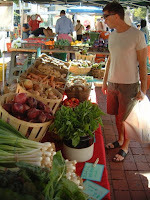 Pleasant's farmers market opens on Saturday too, from 9 am to 1 pm. There's too much to list here, but their listserve posting has a ton -- produce, meat, eggs, cheese, bread, and more. There's also Latin American food, compost help, and a bike clinic. They're also looking for volunteers, and they too have a Facebook page and Twitter. At the same time, there's the Mt. 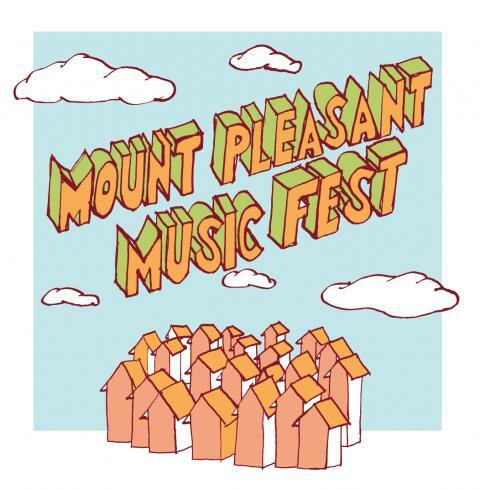 Pleasant Music Fest from 2-7 pm, featuring some local bands. Might be a good time to snack on some of your newly purchased farm goods. For those who can't wait until June 5 for the Columbia Heights Community Marketplace, the 14th and U Farmers Market opens on Saturday from 9 to 1. There will also pork, beef, goat and lamb, plus eggs, cheese, pies, breads, jams, and flowers. I'm getting hungry. As we mentioned previously, the DC Commission on the Arts and Humanities is holding a contest for Columbia Heights residents to design 17 mosaic medallions along 14th St NW between Park Rd. and Irving St. The deadline on that project has been extended to Monday, May 3 at 6:30pm. More details on the DCCAH website here and here. 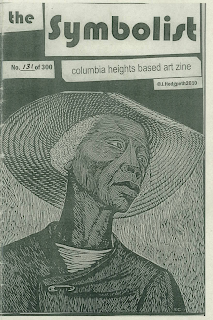 This post by Emily S.
While enjoying Wonderland’s glorious patio with many of my neighbors yesterday evening, I was handed the Symbolist: columbia heights based art zine." It's a 14-page booklet, compiled by J. Hedgepeth and Jonas Wolfe and filled with artwork, film and play critiques, exhibit info, and interviews. I was impressed; not only by the art itself, but also by the imaginative and unpretentious writing and layout. As a left-brainer, the ability to identify with and feel comfortable with art and its ensuing culture has always been a challenge for me. 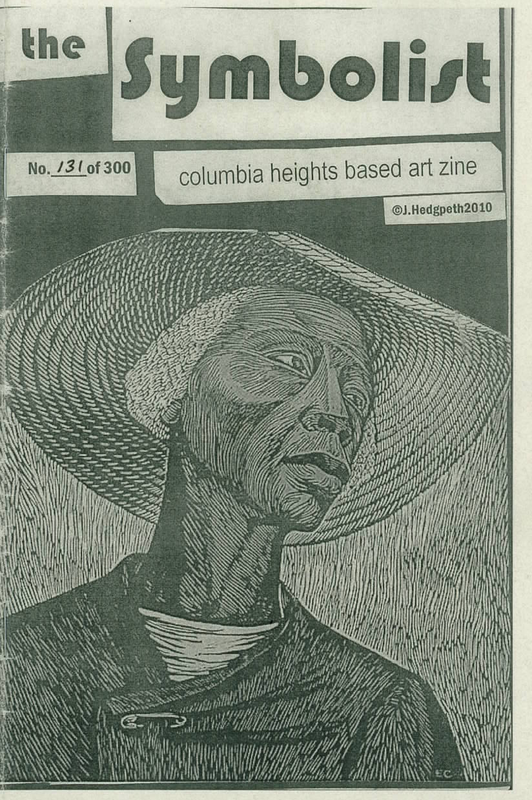 This zine, however, displays the articles and artwork in a creative and relatable way with the light and bright content popping off the darkened pages. 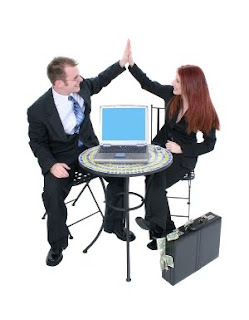 The articles themselves are concise and accessible, informative and eloquent. The authors don’t seem to take themselves too seriously (using one of my favorite colloquialisms – “obvi”), but intelligence and originality are apparent. As the back cover reads, "things are more complex than they can be represented." While I agree with the authors, I think that they do a damn good job breaking it down, and I look forward to the future representations of the local art scene’s complexities. Now if I only knew where to find it next month…. 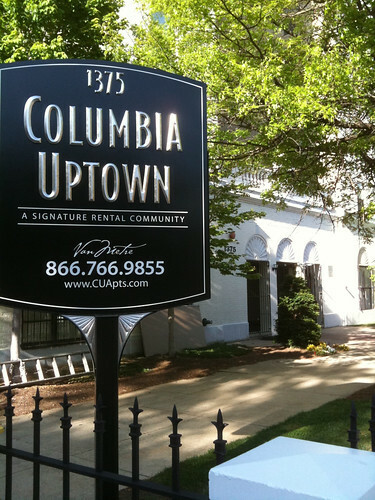 Looks like the old Amsterdam apartments at 14th and Fairmont are getting a facelift: the building was recently rebranded the Columbia Uptown, with a fresh coat of paint and new management. The sign says they're remodeled as well and they have a fancy new website. Tweet for a Treat! April 30th we'll give a random Twitter follower dinner for 2 & a CommonWealth tee-shirt! Keep up with Pub promotions, news and specials. Looks like Eatonville at 14th and V is becoming the spot for famous people. The other day I spotted on their Twitter that Stephen King, Matt Groening, Amy Tan, and more came to eat there on the 21st. The group of writers have a band called the Rock Bottom Remainders, and they were playing a show at the 9:30 Club that night. However, I'm not sure if they were all there, or if it were some other folks: We Love DC mentions Dave Barry and Mitch Albom, but no Groening. In any case, lots of famous folks in the neighborhood. Thanks @CornelWest for coming for lunch. Honored that you love our Crispy Chicken and homemade biscuits! Richard Jenkins was at Eatonville a few months ago too. 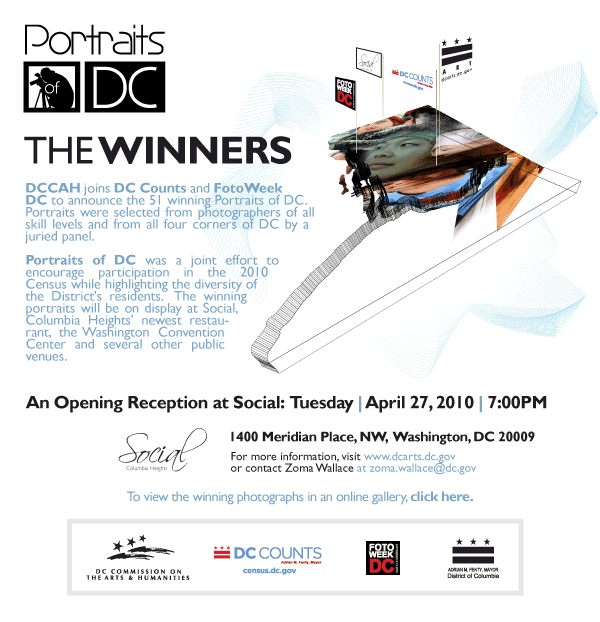 If you're in an artistic mood tonight, check out Social at 14th and Meridian, which is hosting an installation of Portraits of DC, a photography contest to capture the diversity of DC residents. There are 51 winning photos, which have the overall goals to promote the 2010 Census and the DC Counts campaign, which aims to encourage local people to fill our their Census form. The reception starts at 7 pm. The Post has an article on the project as well. DC Government and the DC Commission on Arts & Humanities also provided support. A couple of weeks ago I wrote about the Sherman Avenue streetscape plan, which aims to make the street more of a nice-looking neighborhood street and less of a high-speed thoroughfare. 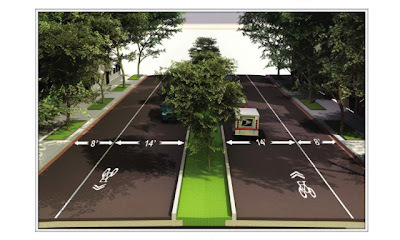 I was looking around for more info and noticed a DCist post that actually has an image of the planned street, and it looks pretty impressive: there's a nice grassy median and tree boxes, bike lanes and narrower travel lanes (plus for some reason a mail truck). The rest of the DCist post is a little old (the meeting mentioned was the same one I wrote about awhile ago) but at least you get a visual. Construction starts in July, and is expected to finish in December 2011. 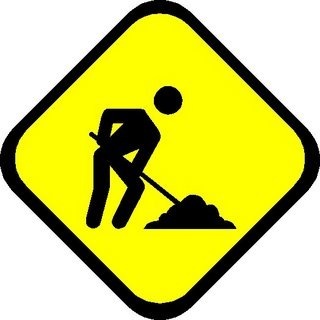 You can track the project on DDOT's site. UPDATE: Construction is planned to end in December 2011, not 2010. 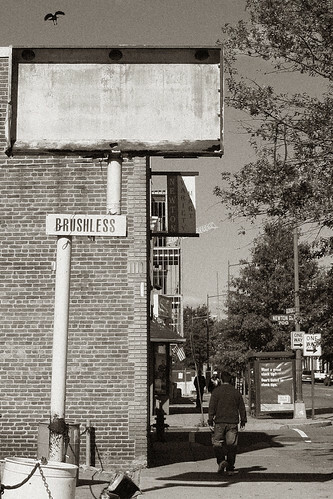 Economic rebound in Columbia Heights? Lately it's looked like the economy is doing well in the neighborhood. It never really slumped too much, at least as much as the rest of the country, but housing rental and sales were low, and some folks cited the economy as a reason for not opening stores (like Ellwood Thompson's) or for closing them. However, the City Paper recently posted a piece where Columbia Heights was the "hottest" residential real estate neighborhood according to Redfin, a real estate website. And just this month there are a number of new retail and food spots opening up, like Alero coming to the Rumbero's space, Pica Taco at 14th and Florida, and Z-Burger. 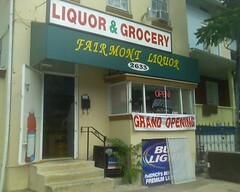 The Columbia Heights Community Marketplace is opening soon too, which should bring more people to the neighborhood too. It might be too early to tell, but it looks good to me. I'd like for there to be more interesting retail, especially of the non-fast food kind. Fast food is tasty, but too much is never a good thing -- either for your stomach or for your neighborhood. 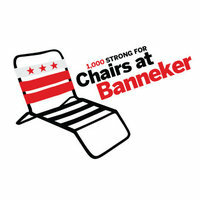 DPR: There will be more chairs at the Banneker pool! Good news for poolgoers: Sean Link from the city's Department of Parks and Recreation just emailed me saying that there will be 60 new pool lounge chairs at the Banneker pool this summer. Looks like the people on the Facebook group will be pleased. He also said there will be a limited number of umbrellas, and they'll look into adding more. Nice! 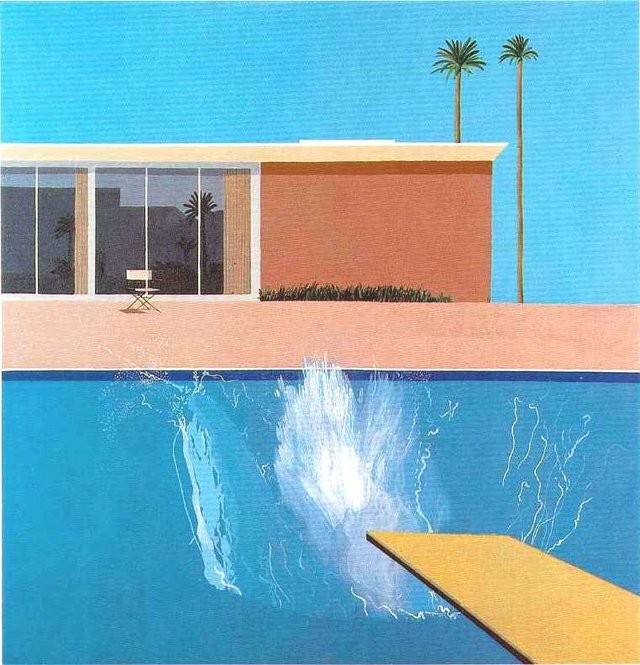 The pool will be opening on May 29, 2010 for weekend operation only (12pm – 6pm, Sat & Sun). It will switch to a daily schedule on June 21, 2010 (Mon, Tue, Wed, Fri, 1pm -8pm; Sat & Sun, 12pm – 6pm; Closed on Thursday). The pool is located at the corner of Georgia and Euclid. It's free to city residents. 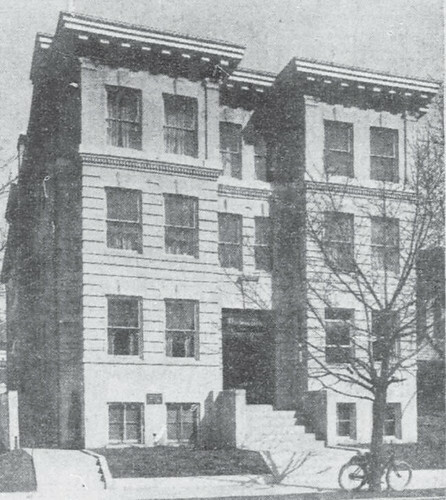 Pretty neat old photo found by Flickr user Rock Creek, showing a now-demolished building at 1467 Irving Street NW. It's now the school complex. Nice looking building. Pretty good deal at the new Pica Taco at 14th and Florida, through tomorrow it's buy one, get one free tacos. Worth checking out, as I've never been there. I've also heard they're going to do two-for-one once a week as well. Here's their Yelp page. They're at 1406 Florida Ave NW. 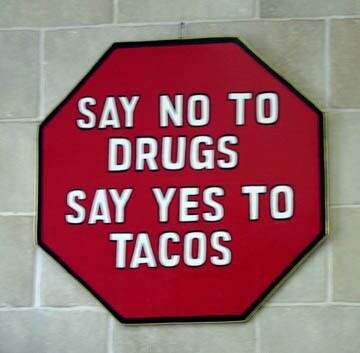 UPDATE: A commenter says it's one free taco with any purchase. So not actually two-for-one. More chairs at the Banneker pool! Here's something I can get behind -- some people started a Facebook group advocating for more beach chairs at the Banneker rec center pool. It's a great (and free for DC residents) pool, but most of the time you end up sitting on your towel. Not exactly earth-shattering, but I'm in favor. Looks like the outdoor pools open May 29. Help decide what outdoor movies you want to see! The folks from Columbia Heights Day will be hosting three outdoor movie nights this summer, and they're looking for your help to decide which movies! Details are still being finalized, but the dates will be June 24, July 29 and August 12. Personally I'm hoping for Indy, Goonies, and Back to the Future. Here's the link in case the poll doesn't load. It's time for another chapter in the Mt. Pleasant library fight: recently ANC1C (the Mt. Pleasant Advisory Neighborhood Commission) funded a study into the redesign of the library, and it found pretty much exactly what the District Library Dynamos had been complaining about: the ramp is long and steep, it is unfair because it makes ramp users go to the back of the library, and the alley is too narrow. However, it should be noted that ANC1C commissioner Chris Otten is also the main spokesperson for the District Library Dynamos. One could argue whether or not it's a conflict of interest, the ANC funding a study that addresses questions brought by a group an ANC commissioner is involved with. Then again, you could argue he's just being active in the neighborhood, but either way, I'm not terribly surprised that the study agrees with the Dynamos' arguments. The City Paper commenters (full disclosure, the first of which is me) make good points too -- how can a wheelchair ramp be both too steep and too long? Here's the full report on the ANC1C's site. Finally! The always almost empty DCUSA parking garage has a use. WMATA agreed with the city to rent parking spaces at the garage for employees at their northern bus garage, and to run a shuttle back and forth. The deal has WMATA renting 250 spaces for $125 each month, or $375,000. WMATA will also pay for the shuttle and for security in the garage when it would normally be closed. The northern bus garage, at 14th and Buchanan, has a parking deck, but it was deemed structurally unstable. Greater Greater Washington reports that Target, which has the right to approve any deal, balked at the deal initially, which is ridiculous since no one ever parks there. Jim Graham and city administrator Neil Albert then pressured them to accept it. Target really needs to get past the suburban mentality that led them to force the city to build an overly large parking garage for the project. Currently, operating the garage costs the city $2.1 million a year and it has nothing going on inside it. While this might not be the most vibrant use of the garage, at least it'll save some money. Want to celebrate Earth Day? 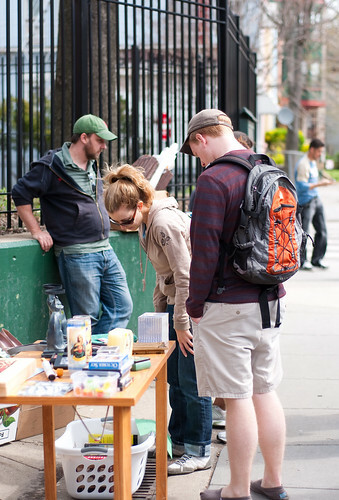 Want to help out the upcoming Columbia Heights Community Marketplace? And do you like beer? If so, this is perfect. Neighborhood watering hole Wonderland is hosting a happy hour from 5-8 pm to benefit the market, which will open on June 5th and have both locally and sustainably grown food. There will be lots of deals too: $2 off all draft beer, $1 off rail drinks, and $3 footlong hot dogs, plus prizes like gift certificates to Wonderland and the Community Marketplace. The Columbia Heights Community Marketplace kicks off its weekly festival of food, fun and entertainment -- a veritable Festivus -- on Saturday, June 5 at 9 a.m. at a key commercial, cultural and social hub in Columbia Heights – the plaza and fountain at the intersection of 14th Street, Kenyon Street and Park Road, NW, one block north of the CH Metro station and across the street from the Tivoli Theater. 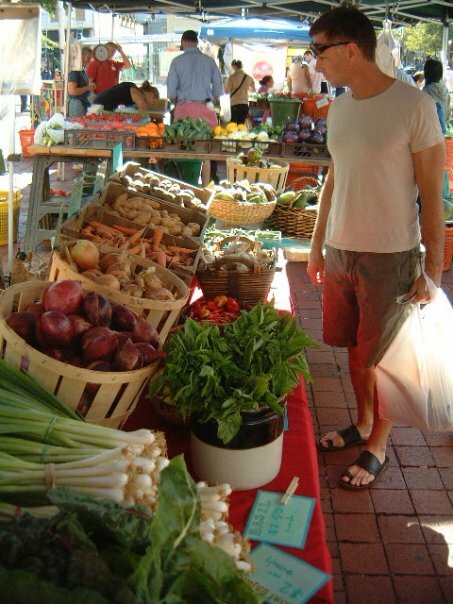 The various aspects and components of the Columbia Heights Community Marketplace, including the farmers market, entertainment and services, will show the key role that locally and sustainably grown food has in connecting, celebrating and strengthening community and culture. The Columbia Heights Community Marketplace also has a Facebook page. 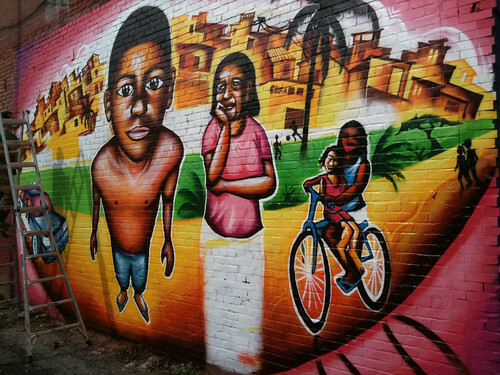 Interesting video from the BBC, who have a report on murals popping in a number of neighborhoods around Washington, DC. 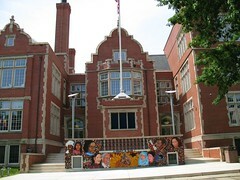 They talk about how kids are often involved, and visit one in our area located just off Georgia Avenue and Howard University. A number of similar murals have been painted around the area, like the one on Kenyon Street that a lot of kids helped design and paint, plus a few others on the wall of Bloombars and in the 14th and Girard Street Park. Nice to see something like this make the international news. Wanted to save this until the end of the day -- it looks like yesterday or the day before, this blog had its 400,000th page view since starting in March 2008. Thanks to everyone for reading, commenting, and sending tips and questions -- your interactions help make the blog what it is! Phil Mendelson was first elected to the City Council in November 1998. He is the Chairman of the Committee on Public Safety and the Judiciary and is a member of four additional committees: Health; Housing and Urban Affairs; Human Services; and Libraries, Parks, and Recreation. Along with representing the Council at the Metropolitan Washington Council of Governments, he is also the Immediate Past President of the Association of Metropolitan Planning Organizations (AMPO). The other day it was nice out and I walked by Rita's, the ice cream and frozen custard place on the Columbia Heights Civic Plaza. I noticed they had a black sheet over the window, and next door there was a for lease sign. I hoped the lease sign was for Score!, the test prep place, and maybe Rita's just wasn't open for the season yet -- last year, they opened in March. Turns out, they're closed. The "scuttlebutt" on Prince of Petworth a few weeks ago was that they might be reopening across the street in DCUSA, but I emailed the company today asking what happened to the store and they said "we do not anticipate it reopening this season." When I asked specifically about DCUSA, they said they were in the process of opening 3 locations, none of which are anywhere near DCUSA. PoP later said that a frozen yogurt place called Fro-Yo would be opening in Rita's old space on the Civic Plaza sometime this summer. Always nice to see this. Also pretty funny to see the guy with the Heath Shuler jersey. 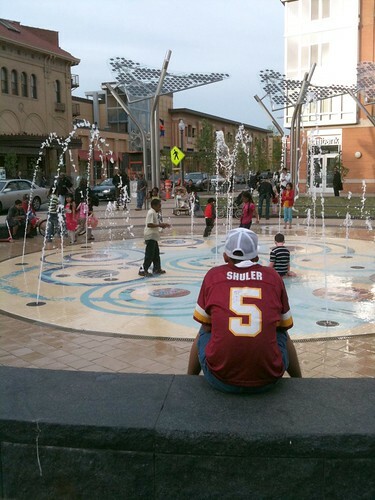 If you recall, Heath Shuler was a very crummy Redskins starting QB for a very short time -- ESPN rated him as the 4th biggest NFL draft bust of all time. Now he's a congressman is North Carolina. 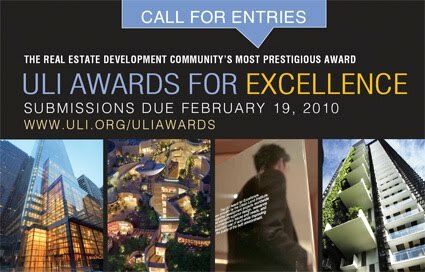 Looks like the hood is doing pretty well -- in addition to a number of awards to area condo and apartment buildings, the Urban Land Institute, a big urban planning think tank, recently awarded Columbia Heights with their annual Award for Excellence. ULI has been a fan of the neighborhood for awhile, with the City Paper noting a study they wrote awhile ago about the neighborhood, which concludes with "the phoenix has indeed risen." 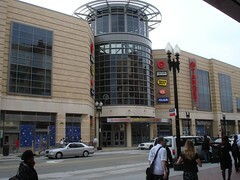 NBC4 has the story too, with the added tidbit that ANC commish (and South CH Civic Association presidnet) Sedrick Muhammad notes that the Best Buy is the second busiest on the east coast. Just spotted a new taco joint, Pica Taco, which is opening on the south side of Florida Avenue, just west of 14th Street. There's already a location on Columbia Road in Adams Morgan and it's pretty highly rated. Looks like burgers are about to become more plentiful in the neighborhood. 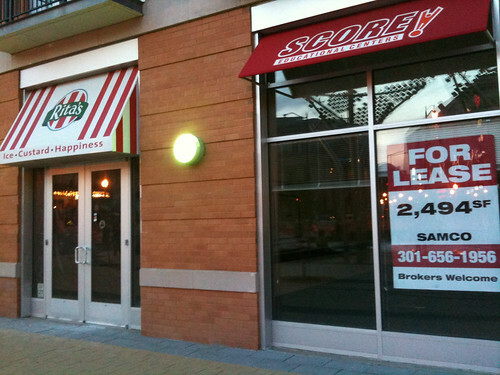 Via the Wash Biz Journal, it looks like DC burger chain Z-Burger is trying to come to the neighborhood. The reporter from Biz Journal said they wouldn't specify where exactly, but there do appear to be some open spots in DCUSA. Hopefully they're not taking the Ellwood Thompson's space. I wonder if the neighborhood can support two fast burger places -- Five Guys and Z-Burger. I would assume yes. Z-Burger's two current locations, in Tenleytown and Glover Park both get 3.5 stars out of 5 on Yelp. It looks like folks say they're better than Ollie's Trolley downtown, so that's something. Did you get a ticket for parking in a street-cleaning zone from April 12-14? If so, you might be able to get the ticket erased. Turns out DPW wasn't supposed to ticket anybody in the area bounded by H to Florida and 15th and 5th Street NW, so if you got a ticket there those days, give them a buzz. The contact is Kevin Twine, kevin.twice@dc.gov, 202-671-2593. Doh. Two meetings Monday: the 14th/Oak/Ogden triangle park and the NW Columbia Heights Neighborhood Assoc. If you're interested in the park at 14th/Oak/Ogden, head over to Stephen's Church (1525 Newton Street NW) on Monday the 19th at 6 pm. They're showing their new design, which includes a rain garden and some seating "pods." 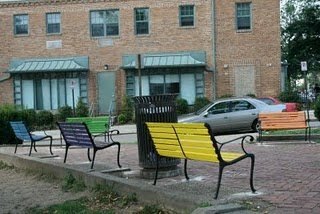 Looks like they're taking away the painted benches that are there now. The park has become well known for drug dealing and criminal activity, and maybe the redesign will address that -- like the one for the park at 11th and Monroe. Then, right after that at 7 pm at St. Stephen's, the Northwest Columbia Heights Neighborhood Association is having their meeting, which will be attended by DC councilmember Kwame Brown and Landy Thompson of In Da Streets, a nonprofit. Yuh-oh. Looks like 14th Street traffic is going to get worse before it gets better. WJLA has a somewhat undetailed article on the project, which starts today and will make it one lane in both ways on 14th from Monroe to Irving. The rest of the plan is at the Streetscape Plan's website. 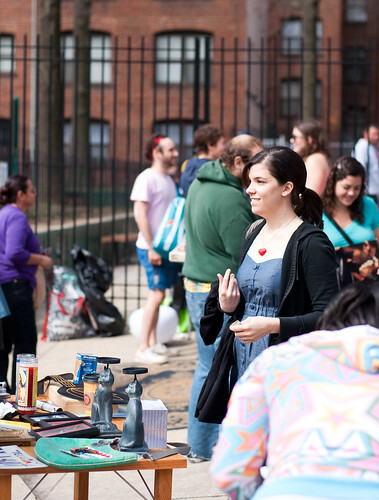 Hope you made it to the Columbia Heights yard sale/neighborhood cleanup about a week or two ago. If not, my buddy took some nice pictures of it. Looks like a good time. Check out some rugby this weekend at Cardozo HS! The Washington Renegades, a local multi-cultural team, plays their spring homecoming matches this Saturday at Cardozo HS at 14th and Florida. One of their teams, the Renegade Reds start at 1 PM vs. the Washington Irish B-side, another, the Blues, play next against Virginia Beach RFC. They note that no dogs, smoking or booze is allowed. 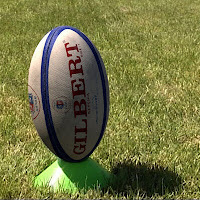 Rugby is pretty intense and fun to watch, and it's always cool to see different sports played in the neighborhood. If you need some coffee today, head over to our neighborhood Starbuckses (or any other) with a reusable mug and get a free cup of joe. Not a bad deal. UPDATE: Looks like you get a free burrito, bol or salad at Chipotle on the 17th or 18th if you buy one the 15th. Did you lose power last night? Did Pepco tell you ahead of time? If you follow the New Columbia Heights Twitter, you might have noticed that we lost power last night at about 9 pm, as did a number of other people around 13th Street from about Park to Fairmont. The power wasn't out on every house, and even on our block only about half of them lost power. In some cases just the street lights were out. Pepco just called saying it is a scheduled outage until 4am, we should have recieved paperwork. Obviously didn't. Thanks pepco! Pretty lame. I called Pepco and wasn't able to confirm, but I did, however, learn there's a Pepco customer service Twitter account, which seemed to confirm that there was in fact a scheduled outage. Not cool of them not to let anyone know. I don't envy the customer service guy, however. Power did come back on for us at about 2 am. Who's your councilmember and ANC commish? Lately I've seen a lot of commenters asking questions like who their advisory neighborhood commissioner is and who their councilmember is. A good resource I often look at is the city's DC Guide "Where You Live" site, where you can type in your address and find out what police district you're in, your school zones, elected officials, and more. You can also use the site to find out real estate values (how much is your house worth? How about next door?) and travel directions. It's a pretty cool site, and I recommend it. There's also a bunch more if you go to the DC Guide dropdown on the front page of DC.gov. A couple of days ago, councilman Jim Graham unveiled the Sherman Avenue streetscape plan, which will include "narrower streets, wider sidewalks, a landscaped median, and lots of trees and shrubs," plus shared bike lanes. The idea is to slow down traffic on the street while also making it look nicer. As Graham put it, "Our meeting will send a clear message that we’re not going to have Sherman Avenue be a turnpike any longer. We want Sherman Avenue to be for residents, not speeding motorists." 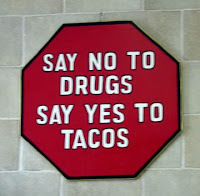 Sounds good to me. Sherman is kind of dilapidated. Here's the progress from DDOT's website. Construction is slated to begin in July. Photo by me. The only picture I have of anything on Sherman. New buildings at Carlos Rosario school -- mixed- or low-income housing? A couple of days ago I got a notice in the mail that the folks at Carlos Rosario Public Charter School on Harvard and 11th are proposing to building two apartment buildings, plus an annex to the school and some "amenities" (as they're called in zoning law) such as "senior housing, affordable housing, and expanded programs of the Carlos Rosario School, which focuses on adult education for the immigrant population of the city." The folks on the South Columbia Heights listserve then got into it, with some worried that it's going to be two 60-foot buildings of all low-income folks, which they argue would increase crime, while some say it's probably going to be mixed-income, and some (namely ANC commish William Jordan) argue that low-income buildings are fine and that people against them are being discriminatory. The plan (linked above) doesn't really say what will be there, but a poster on the listserve says there are a few proposals floating around, some of which are mixed-income, and one which is wholly low-income. Obviously, this is a heated issue, and it depends on what the developer actually decides, but I do agree that entirely low-income housing is not a good idea. Jordan basically ignores the last 30 years of urban planning, when we learned that large (or even medium-sized) buildings housing solely low-income people is not a good idea: it increases crime in the area, which is often caused by people not actually living in the buildings -- that's also what's been said about the buildings at 14th and Fairmont and those on Columbia Road. All around the country large public housing buildings have been torn down, replaced by smaller scattered site housing or mixed-income housing like HOPE VI, which have much lower crime and other issues. It's not about low-income people, it's about large buildings. If these buildings are truly mixed-income (low, medium and higher) then that's completely fine with me. Here's an interesting idea: some Mt. Pleasant ANC commissioners have suggested using DCUSA's large and almost empty parking garage as a base for a "jitney" service to Mount Pleasant, i.e. a shuttle of some sort. Mt. Pleasant Street and the surrounding streets don't have too much street parking, so the commissioners thought this might be a good idea to address that problem. They're working on it with Jim Graham. Sounds good to me, and it will be nice to use that parking for something. 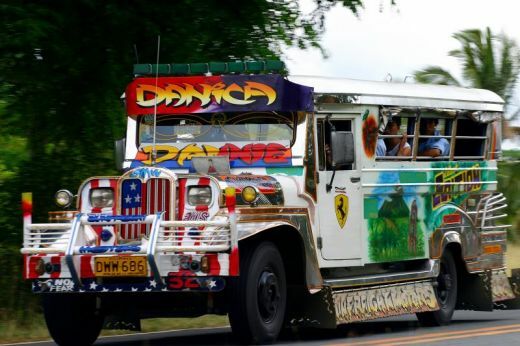 Pictured: a Filipino jitney. Probably not for use in Mt. Pleasant. 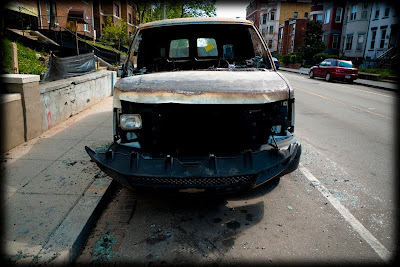 Just spotted some wild photos of a burned van on 13th between Monroe and Otis by the City Paper's Darrow Montgomery. Crazy. Never really got why this happens so often in that area. Is it vandalism? Some kind of intimidation? People trying to get the insurance? Or just faulty cars? I've been watching, somewhat confusedly, the recent argument on the North Columbia Heights Civic Association listserve. Apparently Jeff Zeeman, president of the group, posted about a spring cleanup, and then a few folks started complaining that they aren't having meetings or elections. Zeeman responded that nobody ever expressed any interest, and it went downhill from there. Read here if you'd like to see the descent into craziness. One woman suggests they go have a cup of coffee and discuss their differences, but that doesn't seem to help. ANC commish William Jordan gets into the mix as well. 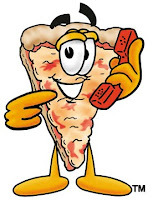 Want to read 3,700 words about neighborhood pizza joints? Do you like Red Rocks and Pete's? Do you like to read a lot? Then check out the Serious Eats blog, which has a 3,700 word piece on the two local pizza joints (plus some other stuff). For comparison, today's front page Post story on Justice Stevens retiring is about 2,000 words. It's a lot to chew on! Ha, get it. El retablillo de Don Cristóbal, or The Farce of Don Cristóbal and the Maiden Rosita, just opened at the GALA Hispanic Theatre at 14th and Park. The play, written by Federico Garcia Lorca as a puppet play and directed by Adhemar and Ximena Bianchi of Argentina runs until May 2, 2010. This version is staged during the Spanish Civil War. Influenced by his passionate enthusiasm for the marionettes of his childhood, García Lorca combines his unique poetic lyricism and the rough folk humor of the traditional trickster in this bawdy and delicious farce in which the old, lascivious Don Cristóbal lustfully pursues the young and innocent Rosita for his bride. This is fertile terrain for the Bianchis’ love of popular art forms: street theater, circus, commedia dell’arte, and Golden Age Spanish theater. In this staging, Republican soldiers and members of the Abraham Lincoln International Brigade who are fighting in the Spanish Civil War celebrate their cause for freedom with impassioned songs of the war and a joyful performance of Lorca’s puppet play. Call (202) 234-7174, visit www.galatheatre.org, or stop by in person to purchase tickets! 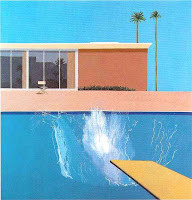 There's also an exhibition of painter Gonzalo Ruiz Navarro in the lobby and Kreeger Art Walk. The artist will be at the theatre today at 7 pm. 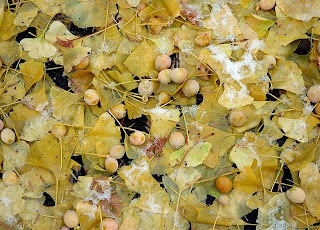 Some good news -- in order to reduce the rotten egg/poop smell that gingko trees give off every spring and summer, the District government is going to spray the fruit of the gingko trees. Let's hope it works. I haven't seen too many of the trees in the Columbia Heights area, but still, every bit helps. The worst is when you walk through them so your shoes smell, then wherever you go, you take the smell with you. Want to garden this year, or let someone else garden? I've written about Sharing Backyards before, it's this pretty cool website where you can either make some ground available for somebody to garden in, or find a spot in someone else's backyard. There's no cost (unless you want to give the person sharing their backyard some of your crop) and in fact a great way to save money, as growing your own produce can be fun and cheap! Here's the site for DC, with a big map. Not sure if you've noticed on the neighborhood listserves, but the Mt. 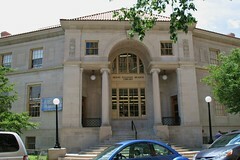 Pleasant public library, at 16th and Lamont has been the scene of a big battle. The library just closed for renovation, and some people are complaining about the renovation plans, saying the new handicap ramp is too long, plus something to do with fire safety, that the ramp will block access to a backyard on Lamont Street. They're pretty fired up about it too (no pun intended), holding a rally and even occupying the library. All the hubbub seems to be coming from a group called the District Library Dynamos, with long-time activist-of-all-trades Chris Otten doing a lot of the posts to local listserves and such. To me, it's kind of surprising that people are getting so bent out of shape. It's not like they're closing the library for good, and there will be an interim library opening on Mt. Pleasant Street NW on April 26. People in wheelchairs can still get into the library once it's renovated, and the fire thing seems kind of pointless. But maybe I'm missing something. Awhile ago, it was announced that the public could start using the nice, new track at Cardozo High School at 13th and Florida. Recently, some folks have said they haven't been able to because it's been closed. Here's the latest details from the principal of Cardozo: thanks to an anonymous commenter for posting it. The track at Cardozo is open to the public (mon.- fri.) 6:30 am to 8:00 am. In the evening during the spring it is open for public use (mon.-thurs.) 6:00pm- 10:00pm. On weekends, holidays, and when school is closed the track is also closed. We continue to remind people that the new track at Banneker recreation center is open 24 hours a day, seven days a week. The commenter notes it's too bad that it's not open on weekends. It is nice to know that the Banneker rec center track is always open, however. It's a few blocks to the east, at Georgia and Euclid roughly, next to the pool. I've had a few people email about this, and now the City Paper's City Desk blog has a piece on it -- a street vendor who usually sets up shop outside Speedy Liquor at 14th and Monroe was recently stabbed after an altercation with a man on the sidewalk. Police have arrested and charged the attacker, which is good. Jeff, the street vendor, is out of the hospital. I think I've seen him around, he usually sells scented oils and plays music on a boom box, and also apparently lifts weights, though I've never seen him do that. Anyway, weird story, and glad the attacker was caught. Looks like the empty spot where Rumberos was is being filled by a similar (but hopefully not too similar) joint, local Latin American restaurant chain Alero. I was never a fan of Rumberos, and while Alero isn't my favorite, it's definitely a step up. I saw the note on the 42 Bus blog, but they don't have a timeline yet. Nice to see an empty space being filled though. I hope they do well, but at the same time don't harm more local places like El Rinconcito II and Taqueria Distrito Federal. 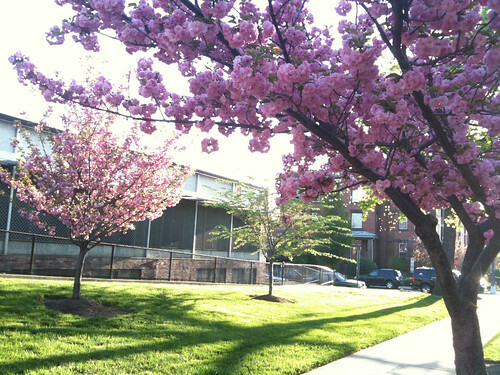 I saw these trees this morning at 13th and Girard -- our neighborhood is blessed with lots of blooming trees and lots more getting greener every day. At the last meeting on the 11th and Monroe Street Park (which apparently is no longer known as Trolley Turnaround Park), the city's Department of Parks and Recreation unveiled the redesign of the park. It looks like there will be some kids' play areas, some seats, and a couple of checkers/chess boards. What do you think? Doesn't seem too different from now, from my view, other than being maybe more inviting, as the park is kind of drab now. Here's what it looks like now from the air. The Civic Plaza fountain is now on! 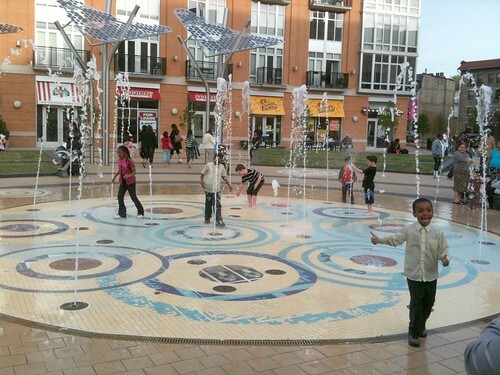 It's looking a lot more like springtime -- I hear that the fountain at the Columbia Heights Civic Plaza is on. It's always nice to see little kids and dogs running and playing in it. I'll see if the one at the park at 14th and Girard (maybe soon to be Barack Hussein Obama Park?) is on too. I love seeing this kind of springlike stuff. As you've probably noticed, the weather in the area is getting really, really nice. Here are some suggestions for good places to take advantage of it. 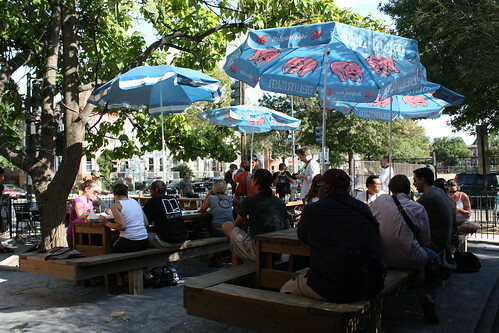 --For an adult beverage outside, I'd recommend the Wonderland and Room 11 patios. Both are quite nice and can provide good people watching -- especially Wonderland's. CommonWealth and Red Rocks are good ones too, though more for the food. --For relaxing outdoors, Meridian Hill Park is the place to be, especially when they have the drum circle/neighborhood fun on Sunday afternoons. No place better than sitting on the grass with friends on a sleepy Sunday. The Civic Plaza is also a nice spot to relax and have a bite to eat from say Sticky Fingers or Julia's. --For being active, check out the soccer field across from Wonderland and join a pickup game. Even if you stink at soccer (like me) it's still a good time and folks are usually friendly. What are your favorite outdoor spots in the neighborhood? This is a pretty cool idea: on Saturday, the organizers of Columbia Heights Day are holding a neighborhood-wide yard sale and cleanup. A lot of local businesses are getting involved too, with deals and other offers, plus there are festivities like a clothing drop-off at the Civic Plaza. Check out the Google Map, below, for locations of the sales and other deals, like at Wonderland, CommonWealth, Red Rocks, Columbia Heights Coffee, and more. Here's the flyer too. In addition, people can meet at the park at 14th and Ogden to help with a neighborhood cleanup -- bring some cleaning gear with you. They'll have a celebration afterwards there at noon. If you live near or use Georgia Avenue, odds are you have some opinions about it. The Georgia Avenue Community Development Task Force is holding a survey in both English and Spanish to get ideas on what should be done. They're also looking for help to distribute the survey around the neighborhood for all those people who aren't on the net, like dropping them in their building lobby, at Howard U, at meetings, in Spanish, and with door-to-doo distribution in April and May. If you'd like to help with any of these, email sylvia@ecacollective.org or call (202) 462-2285. The Georgia Avenue Community Development Task Force is a grassroots community group which began in December 2009 in response to development slated for Georgia Avenue with little or no community input. Large projects such as Broadcast One, the Howard Town Center, the Howard University Tech Plaza, Bruce Monroe, Park Morton and other projects underway will significantly change the face of Georgia Avenue. It is important that the community not only weigh in, but actively work to ensure that the results will meet the needs and desires of the current residents and business owners and preserve the history and culture of the neighborhood. They meet the 2nd Monday and 4th Wednesday of every month, with the next one at 2801 Georgia Ave NW on Monday. Want to learn more about the upcoming farmers market and more, called the Columbia Heights Community Marketplace? Get yourself to 1413 Park Road NW today at 7 pm. 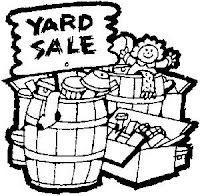 Among other topics, we'll be discussing the need for volunteers to staff our table at the Yard Sale on Saturday, April 3rd at the civic plaza and fountain area (14th Street and Park Road, NW). The idea will be to promote the market, which kicks off the first weekend in June.